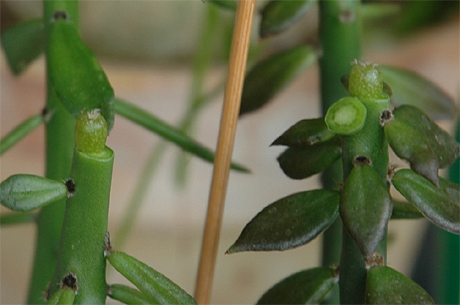 Well, my first experience with grafting on Pereskiopsis spathulata was a limited success – limited by a combination of stupidity and clumsiness. 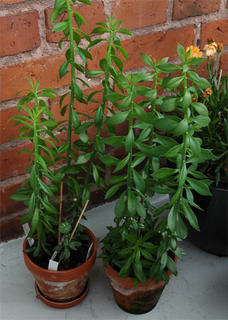 I ignored the advice of experts and watered the Pereskiopsis plants heavily before grafting. As a result the small seedling scions were soon sailing away on a sea of cactus sap. When trying to correct this I managed to knock off half of the scions. 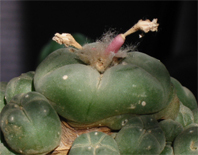 Despite this treatment two of the grafts took (one each of L. williamsii, RS 428A, Cuatro Ciénegas, Coahuila and L. diffusa RS 1193, Peña Miller, Queretaro). 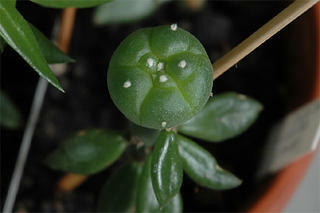 Especially the Lophophora williamsii graft is doing great – in 11 weeks it’s grown to a width of 1.9 cm (0.75’’). The Pereskiopsis spathulata plants are easy to grow. I planted the ‘waste products’ from the graft, and along with the plants where the graft didn’t take, they now make up a shrubbery that would make even the Knights who say ‘Ni’ happy.